The DCT-based transform coding technique was adopted by the international standards (ISO JPEG, ITU H.261/264/265, ISO MPEG-2/4/H, and many others) for 30 years. Although researchers are still trying to improve its efficiency by fine-tuning its components and parameters, the basic structure has not changed in the past 20 years. Researchers tried other methods such as wavelet coding and compressive sensing but they cannot show significant improvement over the existing DCT-coding system. The deep learning schemes recently developed may provide a new direction for constructing a high-compression image/video coding system. The basic ideas are the Generative Model and Autoencoder in the deep learning neural network. Up to now, only a dozen or so papers have been published on this subject in the past two years and the recent results indicate that the potential of compression efficiency offered by this new methodology could be very significant. In this talk, we summarize the basic designs and the progress of this topic so far, and our on-going activity along this direction. From 2006 to 2009, he was appointed as Dean of the EECS College at National Taipei University of Technology (NTUT). From 2014 to 2017, he served as the Dean of the ECE College at NCTU. 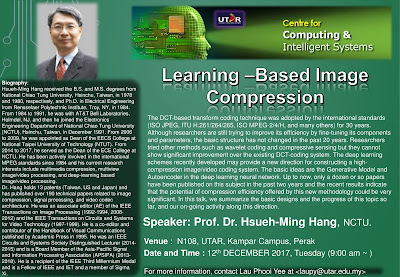 He has been actively involved in the international MPEG standards since 1984 and his current research interests include multimedia compression, multiview image/video processing, and deep-learning based image/video processing. Dr. Hang holds 13 patents (Taiwan, US and Japan) and has published over 190 technical papers related to image compression, signal processing, and video codec architecture. He was an associate editor (AE) of the IEEE Transactions on Image Processing (1992-1994, 2008-2012) and the IEEE Transactions on Circuits and Systems for Video Technology (1997-1999). He is a co-editor and contributor of the Handbook of Visual Communications published by Academic Press in 1995. He was an IEEE Circuits and Systems Society Distinguished Lecturer (2014-2015) and is a Board Member of the Asia-Pacific Signal and Information Processing Association (APSIPA) (2013-2018). He is a recipient of the IEEE Third Millennium Medal and is a Fellow of IEEE and IET and a member of Sigma Xi.